It's a fun trick which will allow you to increase Windows Experience Index Score easily. See this geeky trick and surprise your friends. It's a fun trick that will allow you to change your Windows Experience Index Score. The score is based on several factors like your physical memory, processor, gaming graphics, RAM etc. If you want to increase the score then you'll have to buy a new processor or RAM or Graphics card. But who want to buy a new Computer for merely increasing the score? In this post I will show you how to hack and modify your Computer Score. Modifying your score might seem useless to you but sometimes when you install a new application then some features of that app may be disabled if you have a very low score. Many of you would like to hack this to trick your System to allow you to use those features. For some, this hack will be real trick to flaunt their friends by showing off best rating. 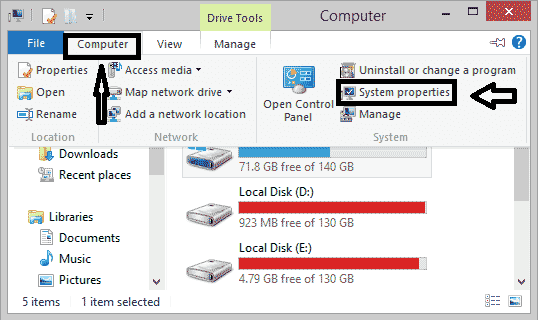 Read: Modify Drive Letters in Windows to edit the drive letters easily. This trick doesn't require any knowledge of programming. You'll only need to focus on each and every step carefully. Let's now see the tweak. You'll first need to navigate to the folder where system score is saved. 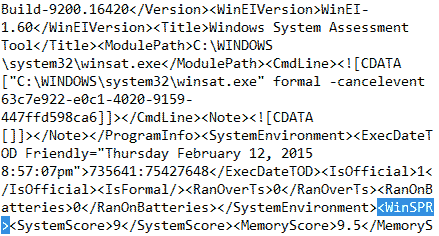 Navigate to C:\Windows\Performance\WinSAT\DataStore. Note: If you installed your Operating System on the drive other than C then look for the folder in that drive. In the DataStore folder, you'll see many files named GraphicsMedia.Assessment, Mem.Assessment, Disk.Assessment, Formal.Assessment etc. 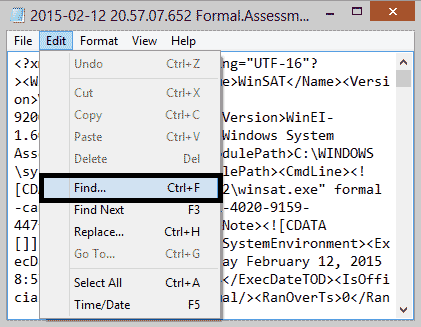 Look for the file with name Formal.Assessment in the folder and open it with Notepad. If you multiple occurrences of this file then go for most recent one. Tip: You can see the date written in the beginning of the file name. For example "2015-02-12 20.57.07.652 Formal.Assessment (Recent).WinSAT". After finding the most recent file we will edit that file. Right click on the file and select edit, to open it in Notepad. Click on the edit menu in the Notepad and select find. When the [find] dialog box appears type <WinSPR> and click find next. Notepad will highlight the code after you click "find next". Now we can begin editing the system score. 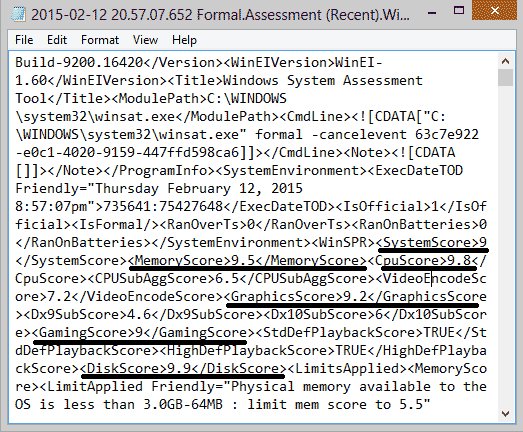 To change the Base Score look for <SystemScore> and change the value written between <SystemScore> and </SystemScore>. Just like that, we can change Processor, Memory, Grahhics, Gaming Grahics, and primary Hard Disk score. See the image attached below to know how to tweak the score of these. Save the file after making your changes. To save Click on File > Save. Important: Don't change the file extension while saving the file. 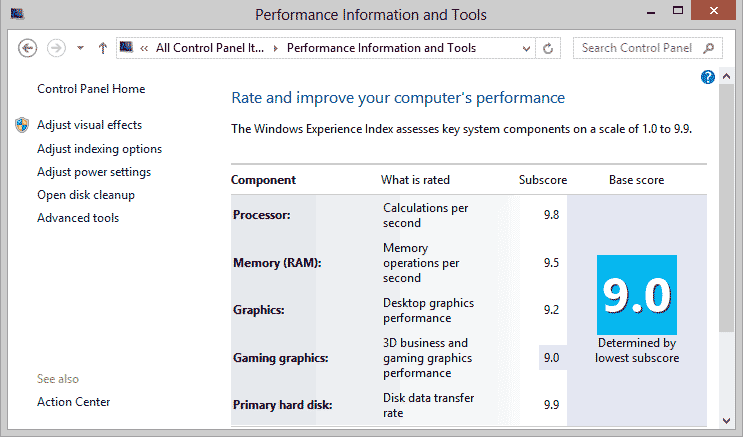 If you're using Windows 7 pC then keep the rating between 1.0 to 7.9 and in Windows 8 you can add the score up-to 9.9. In the Save As dialog box, change save as type to all files (important). If you'll save your file in the DataStore folder now then the permission will be denied. If the permission is denied then save the file in the desktop or other drive. Now, from there, move the file to C:\Windows\Performance\WinSAT\DataStore folder [replacing the original file]. Done! Let's check the rating now. After editing the file you'll want to see the changes now. 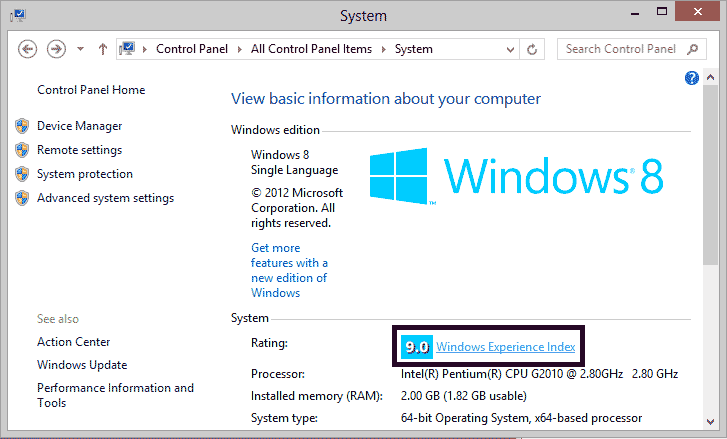 To check your Windows Experience Index Score, follow these steps. See image below to know. or, Open Control Panel > System > Windows Experience Index. If you want to revert the changes to your original Computer Score then Re-run the assessment. It will take a few moments to re-check your PC performance. or if you want to keep the hacked score then leave re-running the test. Score doesn't matter too much and it will not at all improve your System performance. Have fun.